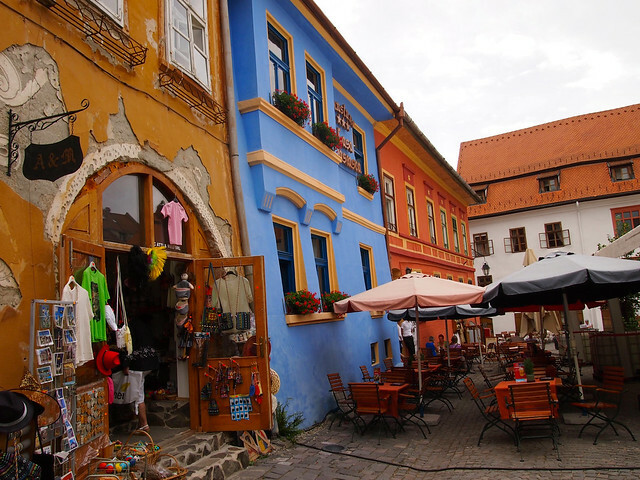 Home » Blog » Reviews » What’s it Like to Travel with Intrepid Travel in Eastern Europe? It's no secret that I've wanted to visit Eastern Europe for quite a while. But, as much as I dreamed about it, the region also kind of freaked me out. It was so… different. So un-commercialized and un-traveled. Eastern Europe is one of those regions that's been stigmatized and largely ignored by the travel community. It's not a region that you're going to find hundreds of blog posts about, or lots of postcard-perfect photos from. In fact, you may not even know anyone who's been there. That was of course the reason why I wanted to visit this part of the world in the first place, though — to discover it for myself and share it with others. Originally, I had considered tackling Hungary, Romania, and Bulgaria on my own. It would take a lot of research and a good amount of planning for this detail-oriented traveler, but I was willing to tackle it. But then an opportunity came along to travel through the region with Intrepid Travel. Intrepid's 18-day “Explore Eastern Europe” tour seemed almost too good to be true when I first read the description and itinerary — it encompassed all of the places I wanted to go and more besides, it would fit nicely into my dates, and it would even open up the possibility to see other parts of Europe while I was there. Plus, it would save me from having to figure out all the little details for myself. 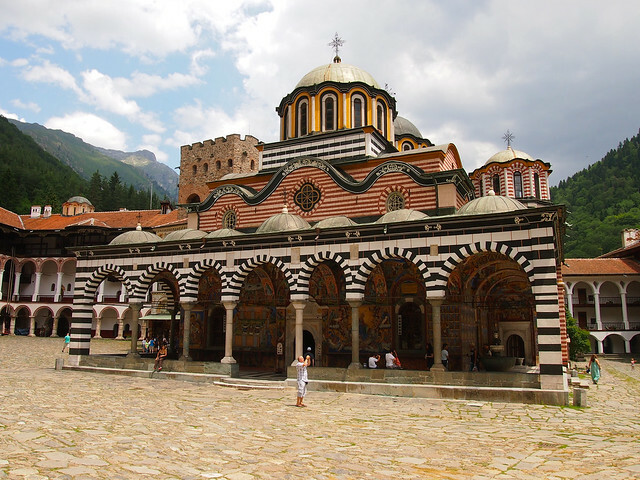 Getting to Rila Monastery, for example, would have been tricky to figure out on my own. I went into my first tour with Intrepid Travel completely unsure of what to expect. Would this tour be everything I hoped it would be? What kind of people would I be traveling with? Would this be a good tour for a solo female traveler like myself? Would I kick myself for going with a small group instead of on my own? Since I had so many questions, I'm sure you do, too. First of all, why did I chose to work with Intrepid over the other small-group travel companies out there? 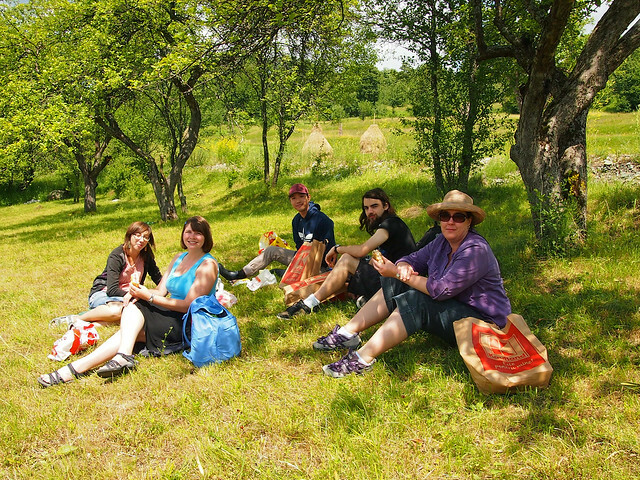 Well, besides the fact that Intrepid's Eastern Europe itinerary was exactly what I was looking for, I also fell in love with the company's mission and focus on responsible, sustainable tourism, and its promise to deliver a “real,” “local” experience. It was a brand that I knew I could stand behind with confidence. 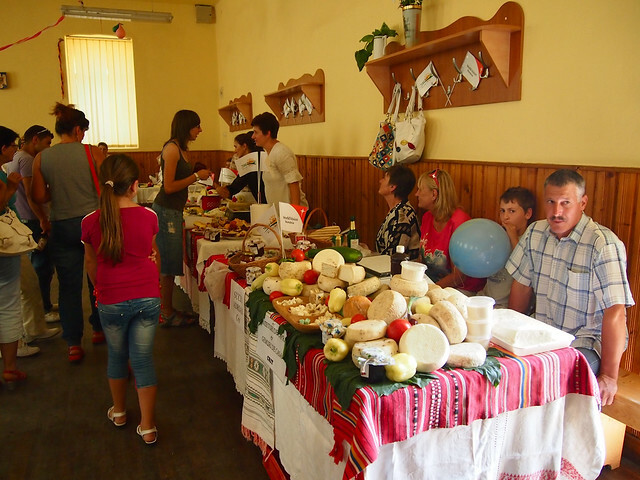 A local market festival in Viscri, Romania. Most of Intrepid's trips allow for a maximum of 12 passengers — meaning you won't be packed into a 50-seater tour bus or need nametags to recognize everyone you're traveling with. My group was even smaller than usual; there were only 4 of us, plus our guide. Ages ranged from early 20s to mid-40s, and the majority were Australians. This, I assume, is fairly typical, since Intrepid is based in Australia, and markets to both young and more mature travelers. But this is definitely no Contiki tour. Intrepid uses local guides when possible, or at least someone very familiar with the region you are traveling through. You have the same guide for the whole trip, and their main job is to get you safely from Point A to Point B — not to be your babysitter or party coordinator. Our guide was a young, laid-back Polish woman named Marta who was perfect for our small, low-key group. Marta and a local Romanian man whose home we visited. Intrepid is quite unique in that its tour guides endeavor to use public, local transportation whenever possible. While we did use mini buses and taxis when there were no other options, most days we were traveling on local trains and buses and walking to our accommodation. This does mean that the “travel” process can be a bit more challenging/exciting. We had plenty of adventures finding seats on packed trains, navigating stations with signs written only in Cyrillic, and border crossings where no one spoke English. But it's all part of the adventure. 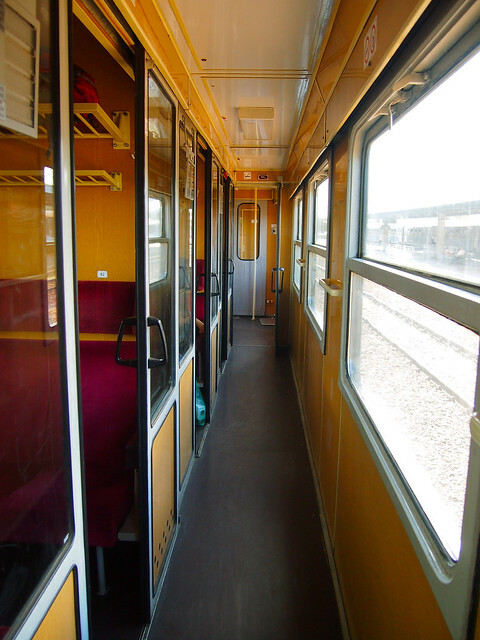 A really nice Romanian train. It depends on the “style” of trip. This trip was an Intrepid “Original,” which means 2/3-star tourist class accommodation — no camping in the bush, but also nothing super fancy. Unless you pay for a single supplement, you'll be sharing a room with at least one other person. 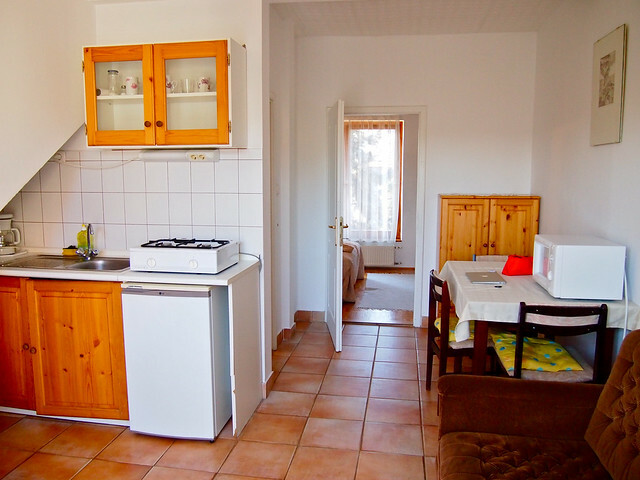 And, even if you do pay for a single room, there are some places where it's not possible to get a room to yourself (in Bulgaria, for example, the single supplement for this specific trip doesn't apply). The type/quality of lodging can also depend a lot on what country you're in, of course, but for the most part we stayed in nice budget hotels and guesthouses. The guesthouses were the highlights of this trip, and embody Intrepid's mission of responsible tourism — they are owned by locals, allowing you to have a very authentic experience while at the same time giving back to the community. 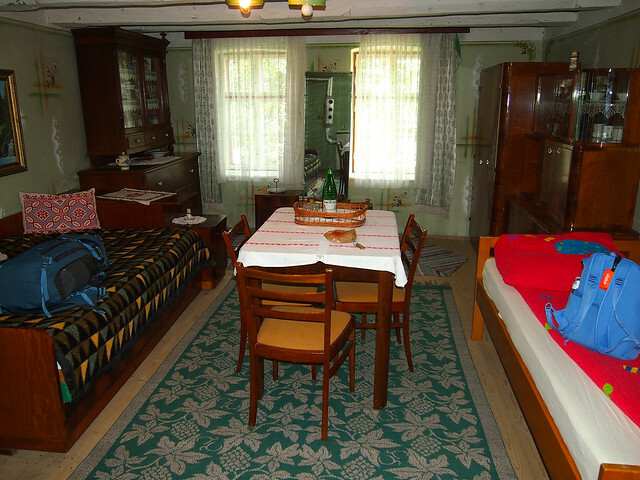 This guesthouse is an old farmhouse that was built in 1748! Unlike some other tours I've been on, there was no pressure on this Intrepid trip to partake in large group dinners at subpar restaurants. 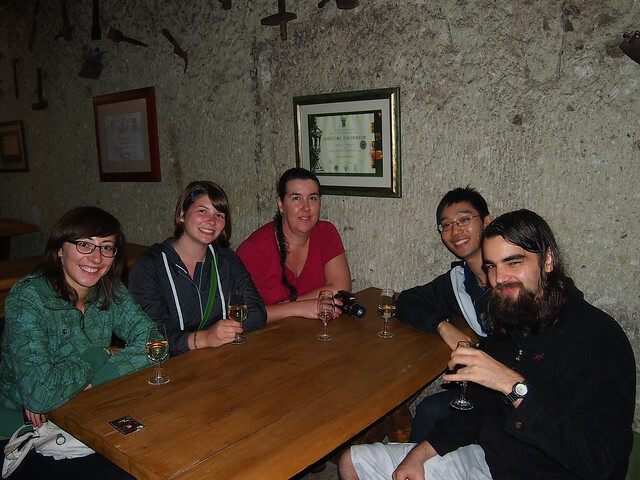 Our guide, Marta, would ask around about traditional restaurants when we would arrive in a new place, and then would give us an option of a group dinner or doing our own thing. Most nights, we ate together, but there was certainly no pressure to do so. And if you are staying in a guesthouse and your guide mentions that your host can cook you dinner for an additional fee? NEVER turn it down. 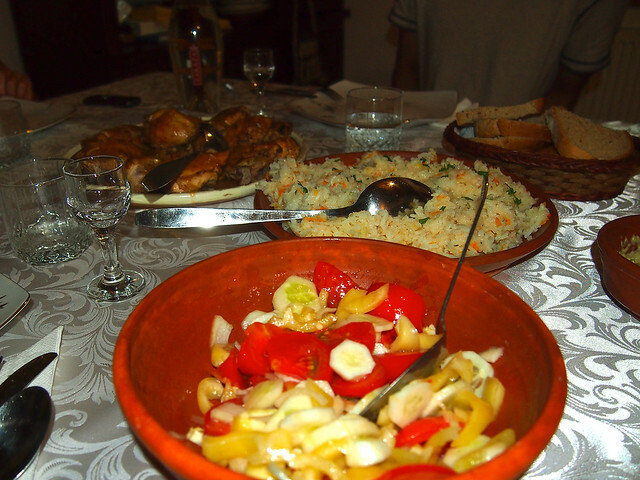 Some of our best meals were home-cooked ones. On this particular trip, we ate a lot of meat, and a lot of tomato/cucumber salads, which are staples in this part of Europe. Intrepid's target market is the adventurous, somewhat independent traveler; not your average package tourist. Therefore, tours are usually a nice mix of pre-planned activities and flexible free time. 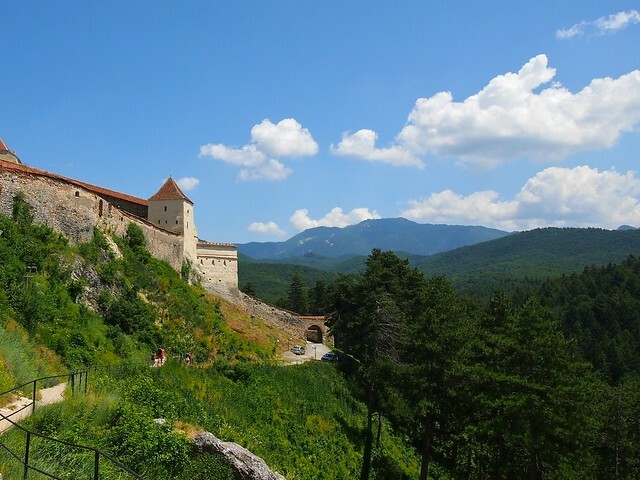 Some extras that I signed up for on this tour included a day trip to “Dracula's” castle in Romania, and a visit to the dancing bear sanctuary in Bulgaria. 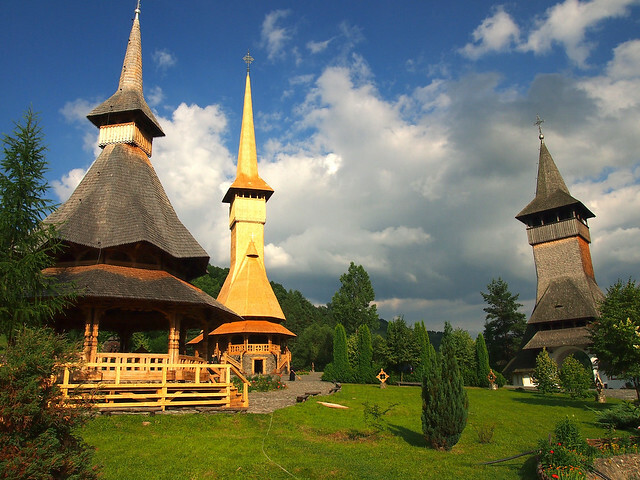 Barsana Monastery, included in a pre-planned day tour of the Maramures region of Romania. 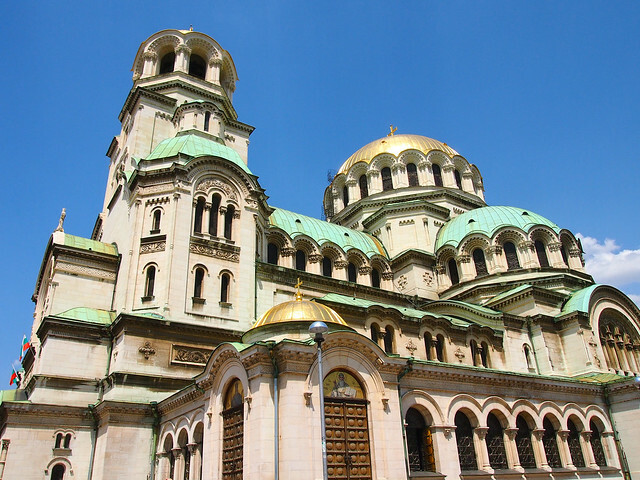 Alexander Nevsky Cathedral in Sofia – we went here as a group in our free time. We also did extra things as a group, such as visiting fortresses, having picnics, and seeking out swimming pools. But there was usually at least one opportunity each day to explore on your own if you wanted to. The main goal of an Intrepid tour is to allow you to truly experience a destination, and the itinerary does its best to help facilitate this. 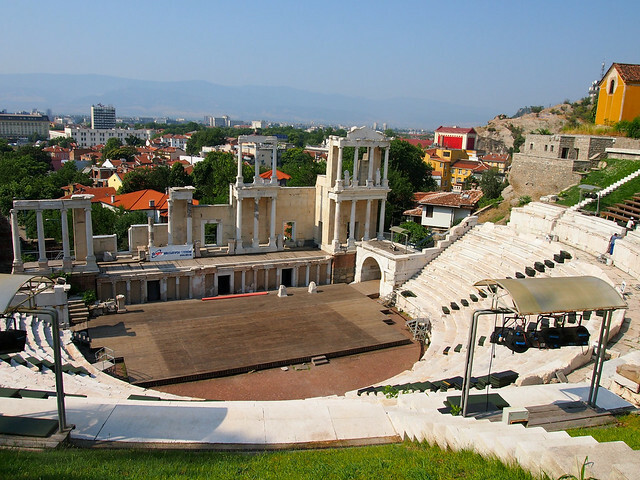 The Roman theater in Plovdiv, Bulgaria – I explored this on my own. The only real downsides are the same ones that accompany any sort of organized group travel: you do sacrifice a bit of independence. If you fall in love with a place, you really can't choose to stay any longer without leaving the tour. If you hate your tourmates or guide, you are stuck with them for the whole trip. And, unless you pay extra for it, you aren't going to have your own space in which to decompress at the end of the day (something I often struggle with during group travel). I loved traveling with Intrepid, and this particular tour made exploring Eastern Europe easy and fun, and also gave my parents peace of mind back home knowing that I wasn't trying to navigate this under-traveled part of the world on my own. At the end of the day, I feel like I could have done most of the trip on my own (except for maybe Bulgaria, which was more challenging), but I'm glad I did it this way instead. What do you think? Would you ever travel with Intrepid? If you're interested in doing the same tour I did, you can check it out here. 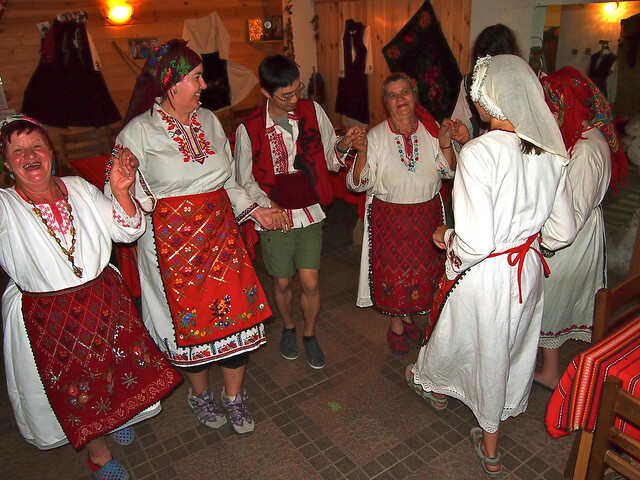 *Note: I went on this 17-day tour through Eastern Europe as a guest of Intrepid Travel. But all opinions, as always, are entirely my own. I have never really thought about travelling to Eastern Europe, I guess that I don’t really know much about it! I would definately consider a tour like this at the start of my RTW trip though! It’s a very cool, very underrated part of the world. You should definitely consider it! I’m actually thinking of a trip to Central Europe after attending the ITB Berlin in March. Will look more into intrepid. They have good Central Europe trips, too, though I’ve only had experience with this Eastern Europe one. Definitely look into it, though! I’ll be at ITB in March too. I come from Lithuania, which is Eastern Europe. I’d love to meet you for a cup of coffee/glass of wine and talk about my country, if you are interested. I have been wanted to know more “real information” about Intrepid, and this is a great review. Helps me figure out if it fits my travel style. That’s exactly why I wrote it, Stephanie! There aren’t that many Intrepid reviews out there that I could find, and I know I certainly wanted to know a lot of these answers before my first trip with them. There aren’t many reviews of this company because INTREPID TRAVEL (#intrepidtravel) constantly monitors & deletes them! I used to love this company and have done many tours with them. They were initially a great company, started in 1989 by 2 Australians. However, their business model has completely changed. They are now a subsidiary of a larger travel company called PEAK that brings in over $400 million per year, have hired a new managing director in late 2012 & have zero quality control of their local guides. A few weeks ago I was sick with fever & refused even the use of a phone to contact a doctor by their local guide & left solo in Nairobi. Immediately prior to this tour, I was on one of their independent tours & the local tour guide hadn’t even heard of Intrepid. I and others have started doing some research on the company & are finding many similar themes. I’m a huge advocate of independent travel & small adventure travel groups though need to warn others of these unfortunate changes from what had started as a really good thing. I’m not sure about your claim that Intrepid monitors and deletes reviews like this – they certainly have no ability to do so on my personal website! I’m sorry to hear you had a bad experience with Intrepid. I’ve heard mixed reviews of ALL tour companies when it comes to Africa. I haven’t done an Intrepid tour there, but I’ve done them in Europe and Asia and had no major complaints. And all the local guides I’ve had have all been very aware who they are working for. But that’s not to say you’re wrong about the changes in the company negatively affecting some of their operations – I’ve heard similar reports about G Adventures lately. We loved our summer traveling through the Czech Republic, Slovakia and Budapest, Hungary. We did it on our own and very much like the way you traveled with Intrepid. We wouldn’t hesitate to travel through Eastern Europe again, in fact we would do that before going to Western Europe. There were less tourists and we found the sights to be every bit as beautiful. Kevin did do a fair bit of research into our trip but for the most part we played it by ear and stayed longer in some places more than others. 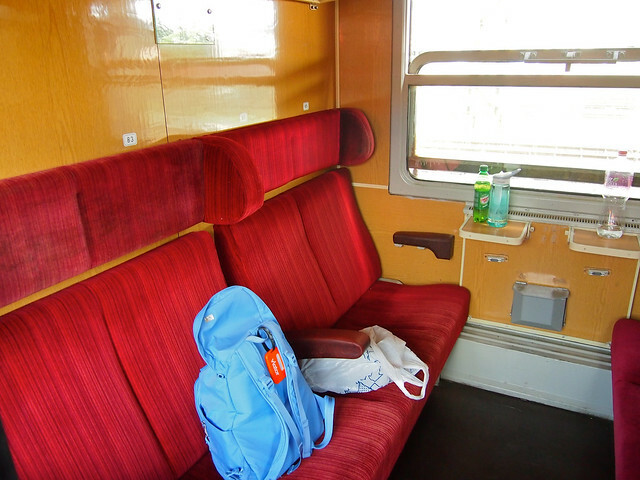 I think for you traveling alone that you picked a great way to travel for your first time in Eastern Europe. Now you know what to expect you will probably feel better about traveling on your own next time. I was very happy with my decision, and am also glad I opted for Eastern Europe over Western (I still haven’t been to places like France, Germany, or Spain!). Like you said, Eastern Europe is much less crowded, but every bit as awesome as Western Europe. This trip was perfect for a solo female traveler like me. This is great info. I have been to almost 50 countries with my husband, but we are considering Intrepid, or Gap, as a possibility for Africa early next year. We are on our 2d RTW, generally avoid tours like the plague, but we have not really been to Africa, and are looking for something a little easier on that leg. This is useful information. I am curious how they would treat a couple, though. Would we still occasionally end up in dorm rooms? Did you have to buy travel insurance, or show them that you had travel insurance? These have been some of the things I have been hesitant about. Glad to hear you’re considering Intrepid, Amber! As for couples and accommodation, like I said, where you stay really depends on the trip and its “style.” My guess, though, would be that if you’re traveling as a couple, you’d probably have a room to yourself most of the time. Unless staying in a multi-share room was the only option on a particular night. You could always call and ask about it, though. And yes, you have to show proof of travel insurance on all Intrepid trips. They suggest you purchase it from one of their partners, but you don’t have to (I just got a cheap policy from World Nomads that covered me for my whole time in Europe). Thanks, Audrey! I definitely had a great time. Aww no! That’s too bad! 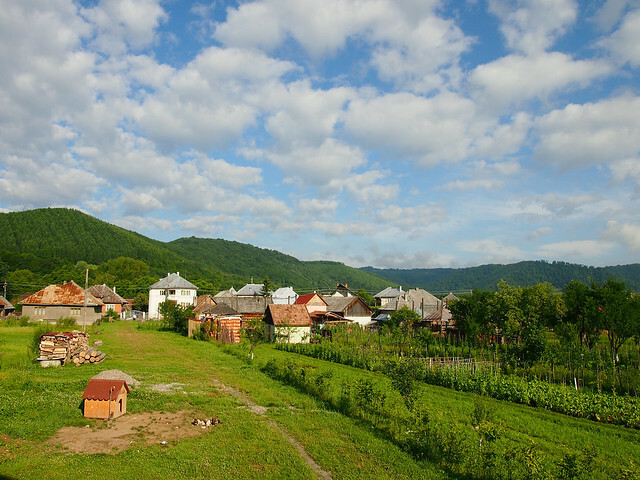 We spent some time in Romania’s Maramures region, which is one of the areas in the country known for its wooden monasteries – they were indeed very cool to see. I guess you’ll just have to go back! As I am getting older and my vacation time is getting shorter, I look for different ways to see a lot in a short amount of time. And while the “old me” would NEVER go on a tour to certain places, I am finding the “new me” values time and money higher then I used to. The biggest key is finding the right tour to fit your needs. I have used Gap (G, whatever) for the past two years and like them a lot. I was so lazy this year, that I even did a G Adventures tour of Alaska, (my own country!) something that you think you could do on your own, but I am so glad I went with them for so many reasons. The way I look at tours is that I use them for a taste of what to see, knowing I’ll go back on my own eventually and know what to see and do next time. There definitely is value in your time, and how you spend your money. It’s one of the main reasons that I’m a fan of guided tours in certain situations. If you only have a few weeks to travel next year, you certainly don’t want to waste any of it worrying about the little details! I like doing things on my own, so considering a tour group when traveling is not something that would usually appeal to me. But when you visit a region that isn’t as easy to navigate and where fewer folks speak English, I suppose it makes a lot of sense. I still don’t know if I could give up my decompression time. It’s so valuable even when I travel alone! I’m glad to hear you had a positive experience overall. Perhaps I’ll give it a go sometime. Tours like this can be a great way to ease into a new region – or even just one you might not feel completely comfortable in. Glad to have been able to help, Leisa! I hope you have a great time in Europe! I’m really glad you found it helpful! I totally understand how exhausting it can be to constantly be organizing transportation and accommodation and all those other annoying little details, especially when you’re traveling alone. Sometimes you really do just need someone else to take care of it for you! Awesome! They are a really good company; I’ve done 3 tours with them now, and have always had a good time. In my younger years travel to other places was definitely not an option. I’ve been to few of the beautiful places. First destinations were Asia and then went to Australia to visit some family members and the last travel destination I’ve been is in Greece. All these tours were accompanied by my parents and older brother. Usually when father gets a leave from being a doctor he sent us to some of the amazing places – as a reward of course for getting good grades in school. But recently after graduating college I value more my work! The schedule of being a Network Administrator is hectic. There goes the words “you need to be online, always”. I had the time off and I found myself searching for travel blogs and destinations preferably somewhere in Europe. Reading your blog and the moments you experienced makes me remember my parents and their constant reminder that I need to get out more often and spend time with them, like what we usually do before. This is great information love and would really considering exploring Eastern Europe. Your parents sound very wise – we all need a break sometimes, and to do that somewhere else in the world with family is great! I’m glad you found this post (and my blog), and hope you make it to Eastern Europe someday.